Barely a month slips by at the moment without my ordering some new flat-packed goodies from IKEA. Our family, still gradually settling into the house we moved into just before our eldest was born, goes about its book-savouring, toy-categorising, craft-supply-hoarding life within a sturdy framework of TROFAST, EKBY and BESTÅ. 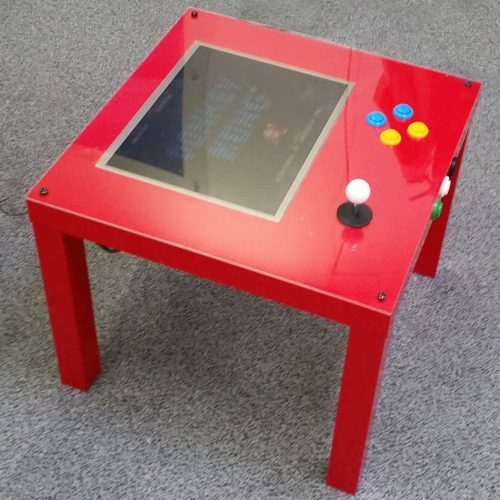 The really great thing is that much of this furniture lends itself to modification, and spannerspencer‘s PIK3A Gaming Table, using a Raspberry Pi and the iconic LACK side table, is a wonderful example. The build instructions over at element14 are generously illustrated with photographs, bringing this project within reach of people who don’t have a ton of experience, but are happy to chuck some time at it. (If I give this one a go, I’ll probably start by getting a couple of tables so that I have a back-up. 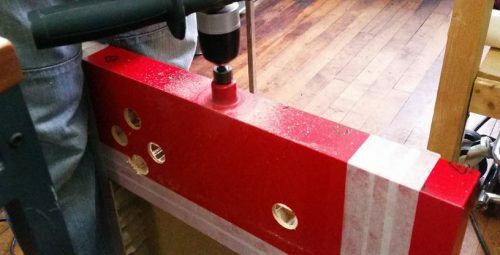 The mods to the table don’t need any fancy tools – just a drill, a Stanley knife and a hole saw – but these are the steps at greatest risk of mistakes you can’t undo.) The tutorial takes you through everything from cutting the table so as to avoid too many repeat attempts, to mounting and wiring up the controls, to the code you need to run on the Arduino and how to upload it. You can buy a new LACK table for £6 in the UK, although the nice red glossy version in the pictures will set you back a whole £2 more. A Raspberry Pi, an Arduino Leonardo, an old LCD monitor, some cheap computer speakers, a joystick, buttons, cables and connectors, and a power supply complete the bill of materials for this build. 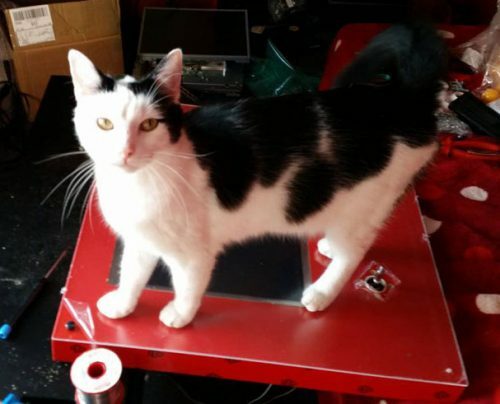 If you want to make it extra beautiful or simply catproof it, you can add a sheet of acrylic to protect the monitor, as spannerspencer has. He’s also included a panel mount USB port to make it easy to add USB peripherals later. The PIK3A Gaming Table went down a storm over at element14, and its successor, the PIK3A Mark II two-player gaming table (using a LACK TV bench) is proving pretty popular too. Give them a go! I really liked your blackboard table mod; Ikea’s so much more fun when hacked! There is a tech expert somewhere in Ikea’s design department. Why else would it be that this same Lack table is the perfect size to take any rack mounted equipment – from servers to guitar effects/power amps. Never buy an expensive server enclosure again. Glad you guys like the PIK3A table (as we like to call it!). We actually made four; two red, a black and a white. The white looks particularly good. They’ve been massively popular. Loads of element14 members making their own, and the tables recently went to the Maker Faire in Newcastle with our buddies from CPC. Great weekend project for the whole family! Absolutely brilliant. We’re doing a arcade workshop in our Makerlab tomorrow, I’ll have to make reference to this great build. I’d love to view the details for this but the Element14 website has been down for the past two days. Looking to build something like this for my daughters bedroom. Hoping the website will be back up and running soon! I’m just working on exactly the same thing! Mine has 2 USB controllers external to the table though. I also took the bottom completely off, to be able to better mount the screen, speakers etc. inside of it. I love IKEA lacks though – I always keep a couple in stock for future projects! For a moment there I thought IKEA had a new product. Here at the Eastwood Academy Southend we are planning to build a couple of these as an extra activity outside of our regular computing lessons.. I think it is VERY important we train our pupils to become MIGHTY PIRATES by playing The Secret of Monkey Island and maybe experience some other classics! Yes! Pikea all the things! Apparently they may even be selling solar panels soon in that particular chain of stores – oooooooh automonous swedish Pikea table. Does the cat come with the table? impressive, all that can be do with a Raspberry ! Very nice idea. It could be a gift for my daughter or for all 80’s lovers. Next time, we will try to find such a table and follow the element14 description. Where can we find the old games such a the Monkey or Street fighter ? You people are all so talented. I’ve been looking for a nice DIY “game” table post to pass along to my FB audience. Thank you – I will share!